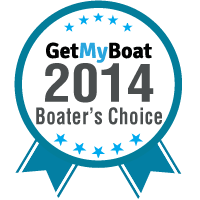 We are thrilled to announce the recipients of our 2014 Boater's Choice Award. These owners represent the dedication and enthusiasm that we hope all boaters experience when using GetMyBoat. It’s time to recognize their hard work. Look for these dedicated captains while planning your 2015 boating adventure.